According to a recent study by Statista, 400 million Instagram stories are posted on Instagram every day. We at The Blogger Programme almost always include Instagram stories in our content requirements when working with influencers, as they often raise the engagement rate and awareness of a campaign. As the influencer marketing industry is getting more and more saturated, the people who stand out are the ones who have a voice, a personality and content that is matching across all features of the platform. Influencers are increasingly experimenting with different apps to edit their Instagram Stories on-the-go to match the style of their Instagram feed. It's time you find your favourite! For this reason, we've put together an up-to-date list of the best Instagram apps that will help you create beautiful Instagram Stories that are unique to you. Advance planning is key for creating a beautiful Instagram story. Planoly helps you plan out your content in advance, auto-schedule your Instagram stories and design them with templates that you can customise with your own images, fonts, colours and text to fit your concept. TBP insider tip: although you can use Planoly without any other software, you will need Photoshop to edit the templates, but the app provides full instructions for them, so it's actually really easy to use! Adobe Spark Post is a creative design app that offers you amazing animated effects to add in your photos. Despite the Adobe name, you don't need any graphic design experience to master this app. Spark Post will suggest you a wide range of professionally-designed templates to choose from, which you can make your own with a few simple steps. TBP insider tip: the app supports Android, IOS and desktop platforms, so you can work from any device you want to! This IOS app functions as more than just a tool to add in a couple of text and pictures. Font Candy offers an extensive selection of hand-picked fonts, lets you invert your text and your background, upload a separate photo to fill your text, add shadows to your text or blend it into your background. TBP insider tip: it even has an Inspiration feed, which allows you to browse other creators pictures when you're out of ideas! Whether you're sharing inspirational quotes, tips or recipes, Over is a useful app that lets you overlay text and graphics onto your photos and videos. 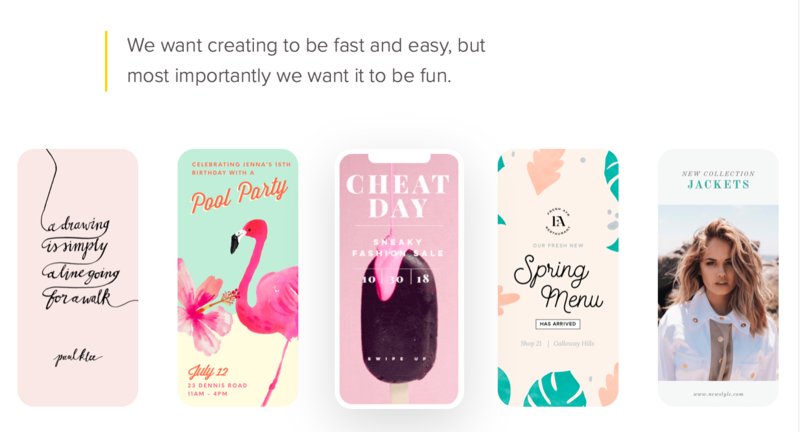 They have custom photos, fonts, graphics and tools for you to choose from to create the Instagram Story that best reflects your personal style. TBP insider tip: look up #bestofover on Instagram for more colourful and engaging graphic text inspo! Feeling frustrated that Instagram cuts your video off when you upload it to Instagram stories? With CutStory, you can import a video from your phone, and the app will cut it up for you and save it to your camera roll as 15 second fragments (or any length you want). Don't worry, your video clips will be saved in chronological order so you won't get confused what to post and when. TBP insider tip: you can also add music, background and create slideshows with your videos before exporting your video. We hope this list gives you inspiration to create your next Instagram Stories! Which apps have you tried before and which ones worked for you? Let us know in the comments! If you're looking for more tips on Instagram content creation, head over to our post on the 5 New Instagram Features You Must Try.